Peterborough United striker Ricky Miller will miss the first six games of the season after being banned by the Football Association for biting. The incident happened while Miller was playing for National League side Dover Athletic against Guiseley last season. He denied a violent conduct charge and requested a personal hearing. 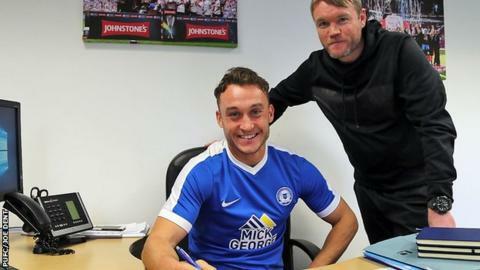 Miller joined League One Posh last month, and chairman Darragh MacAnthony said he was aware of the suspension before signing the 28-year-old. Miller told the club website: "Whilst I apologise for my actions, I was in a situation in which I was struggling to breathe. "I was being held in a head lock by an opponent for six seconds, and felt it was my only option to get out of it, which was acknowledged by the Football Association when the ban was reduced. "It is important to put the incident into a bit of context because I am aware without knowing the full story, people can make judgements, which are not accurate." Former Luton striker Miller's ban is shorter than previous biting suspensions the FA have handed out. Joss Labadie was banned twice by the FA for biting, firstly for 10 matches while at Torquay and the second for six months at Dagenham & Redbridge. Cheltenham Town midfielder Kyle Storer was banned for eight games after an alleged bite on another player, also in the National League, in June 2016. Former Liverpool striker Luis Suarez, now with Barcelona, has been banned for biting on three occasions, with each one attracting a more serious ban. In April 2013, then-Liverpool striker Luiz Suarez committed a similar offence against Chelsea's Branislav Ivanovic and received a 10-game ban, having previously been banned after a Dutch league game while at Ajax. In 2014, he was banned from all football activity for four months, plus nine international matches, for biting Italy's Giorgio Chiellini, while playing for Uruguay during the World Cup.